Jackie Meier paints in the Brooklyn Navy Yard. This site, which once served a very particular purpose, has recently been converted into a multi-use industrial complex. 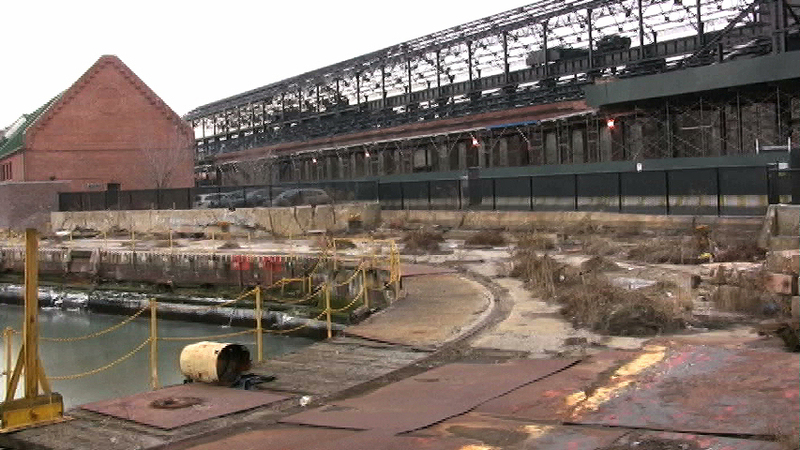 Its website declares “the Brooklyn Navy Yard… represents a variety of industries, like construction, theatrical set design, computer and office supplies…the Navy Yard is capable of handling any type of business.” Contemporary real estate pitch aside, the conveyer belts of the Sweet and Low factory still cycle around endlessly, as they have since 1957. 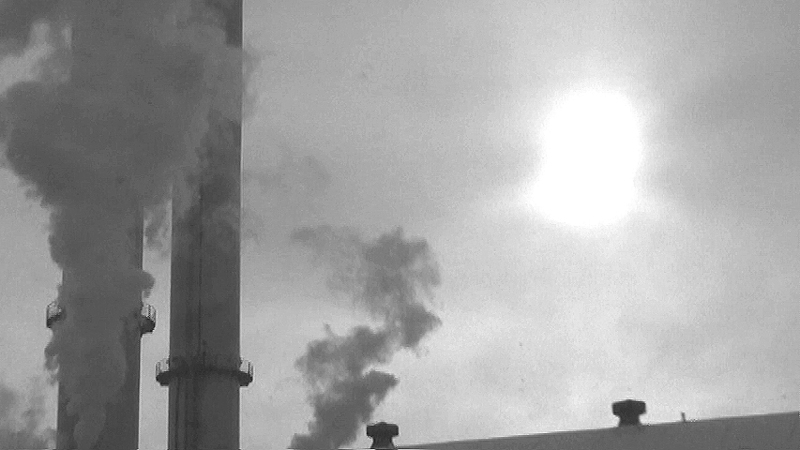 The gigantic chimneys of the Navy Yard Cogeneration facility still belch out voluminous clouds of gray steam, which block out huge swaths of sky, turning the sun’s rays into a dank yellow haze. On a winter’s day, an atmosphere of somber beauty encompasses this landscape. The warehouses and abandoned heavy machinery sit in dramatic relief against the fluid horizon of the waterways and the dry docks, the bridges and the skyline of New York City. In Meier’s newest work, this industrial landscape finds its artistic analogy. By osmosis, the painter has absorbed, but more importantly eclipsed, the abstracted atmosphere of industrial production which surrounds her studio. Since her first solo exhibition in 2005, Meier has been consistently, patiently, and, yes, industriously practicing a very subtle form of abstract painting. The first picture to catch my eye was constructed of interlocking crescent shards of a waxing moon, shapes that bound the picture plane taut. Low keyed in color and diminutive in size, it had a remote but alluring effect. Meier has expanded upon such attempts to present the viewer with seemingly uncertain visual abstract paths and unusual spatial trajectories. She has also added a few new components to her pictures, which significantly increase their overall success: size of format, expanded color harmonies, and a dynamic certainty of constructivist composition. All of this is clearly apparent in her most recent work, entitled Danger, (2013, oil on canvas, 60” x 60”). The palette is skewed toward cooler blues, moss greens and coral flesh tones, which augment these newfound tendencies well. The sightlines of this picture focus solely on a precise center vanishing point, where it shatters into a centrifugal freeplay of optical proportions. The force surrendered by this outward kineticism illuminates the painting with a transcendental radiance. 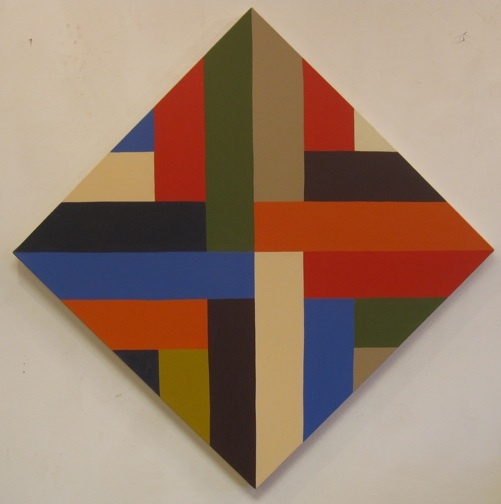 This effect is repeated successfully, though in reverse, it seems, with a larger work called Interlope (2013, oil on canvas, 72” x 72”). Here vortex lines of substantial force bounce back and forth visually within a pictorial field. From the four quadrants of the picture plane to the circumference of this canvas, the structural interplay of color, symmetry and order continually explodes and regenerates itself in artistic perpetual motion. Jackie Meier’s painting procedure is as simple and direct as her no-nonsense approach to the underlying drawing and paint application. Because all of her work is drawn with such a fragility of intent, it deserves close observation. Every issue is held together in a delicate balancing act, an apparent demonstration of will and empathic concern for the viewer beyond herself. She is essentially creating 21st-century humanistic icons. Reflecting Meier’s surrounding environment most clearly is the work The Belgian Fence (2012, oil on canvas, 108” x 108”). This huge painting represents a transitional moment in her oeuvre. 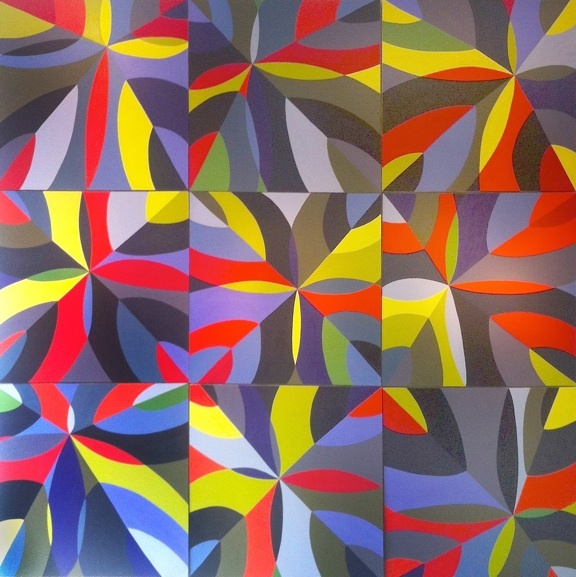 Consisting of nine separate panels or modular units, not unlike interchangeable parts, all are painted with similar but different compositional configurations. Its overall mosaic field of arcs, diamonds and triangles produces a kaleidoscopic wall of visual intensity. It’s an organic geometrical matrix, warm and woven in feeling. 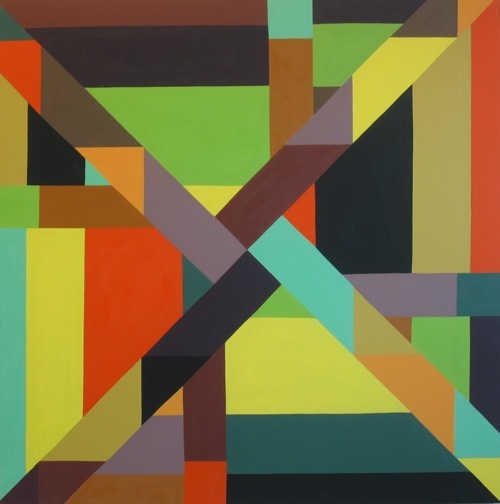 Contrasting with this is the acid-colored Boogie (2013, oil on canvas, 48” x 48”), a complex multi-layered painting that is obviously an answer to Piet Mondrian’s Broadway Boogie-Woogie. However, Boogie is quite a different dance. This painting could only exist today, in the informational space of computer technology. Meier employs a scorched earth policy that has deliberately canceled out any hint of the Dutch artist’s interest in urban cartography, primary colors and right angles. A kind of digital virus is affecting this painting, which, unlike those viruses affecting our home computers, is exciting to discover. 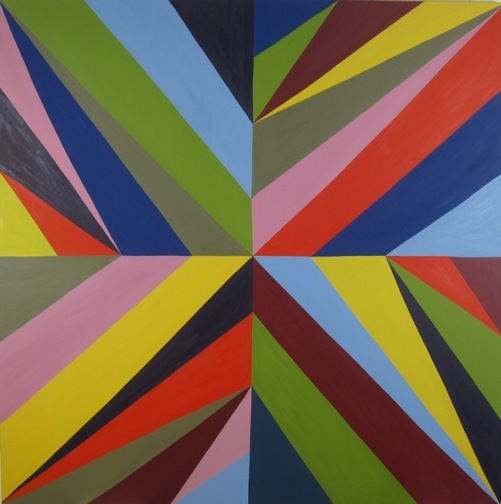 Clashing multi-dimensional chevrons enter from both sides of the painting and abut dead center of the canvas. These two shapes overlay a Hakenkreuz, which breaks down into closely collaborated colored planes, further animating an awesome and hyper-real pictorial machine. A group of smaller works, all from 2012 and 36 x 36 inches, oil on canvas, with titles such as Tumble, Still, Button Up and Dredging, emphasize X’s, chevrons and cruciform shapes directly, with a take-no-prisoners attitude only hinted at in other pieces. This suite of paintings explores sign and symbol, while treating the eye to puzzle-like visual riddles, which contradict their hard-won meditative stillness. 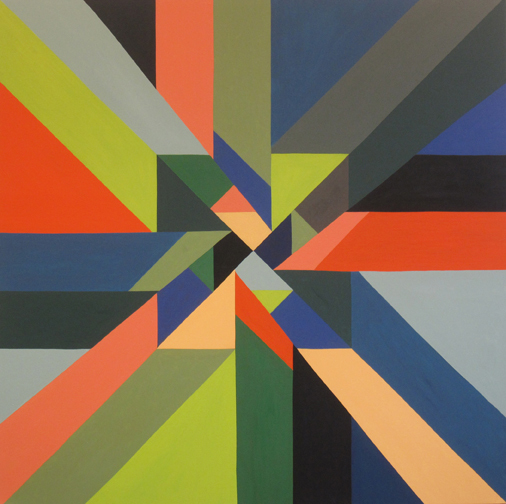 Jackie Meier’s new paintings engage us directly and thoughtfully with the current issues of geometric abstraction. 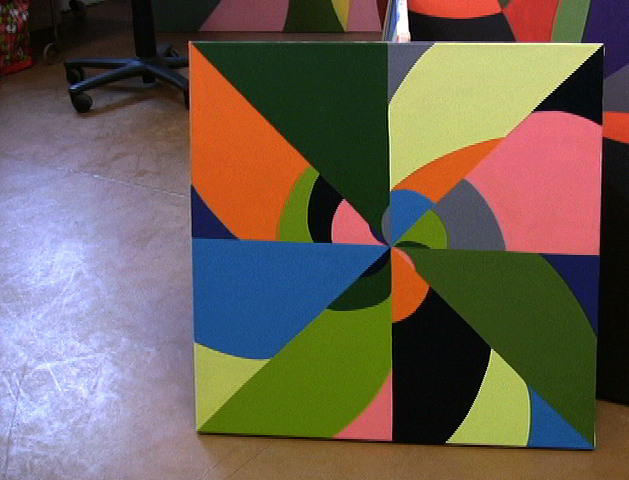 Thirty years ago, no one would have guessed that abstract painting would be so widely practiced today. 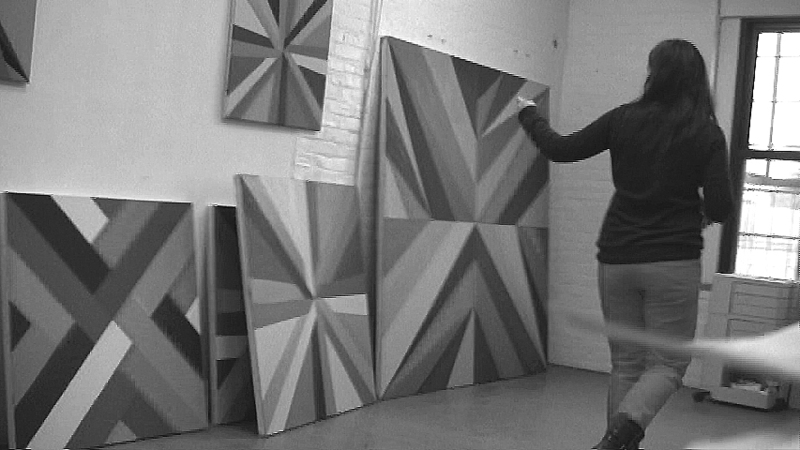 At this moment, hundreds of artists, almost all entirely New York-based, are creating abstraction in either its formal (geometric or reductive) or its informal (casual or otherwise) mode, with varying degrees of success. Regardless of the genre’s popularity, the call of tradition insists upon continuous renewal of quality. Artists are required to break free from the commonality of the herd, as quantity of cause is never enough. If abstract painting is to continue as a challenging idiom and a valid conveyer of meaning, the arcane conditions of its existence must be addressed. Jackie Meier confronts these conditions with absolute honesty and complete integrity. Photographs of the Brooklyn Navy Yard and the artist in her studio by the author.